Although today is my birthday, I feel like I’ve been celebrating it for the past week. Why? It’s because of the three wonderful gifts from last Wed – Sat. What are the gifts? The gifts are all related to connecting with young, smart high school students who are determined and want to pursue education to make a difference. I will detail the three. 1) I mentor an outstanding young man named Gabriel Jimenez, who is a rising junior at Georgetown Univ. He’s from the Compton section of LA, a first-generation college student and a graduate of the Cristo Rey HS program in LA. He graciously invited me to address a group of 44 students last Wed afternoon on the Georgetown campus. 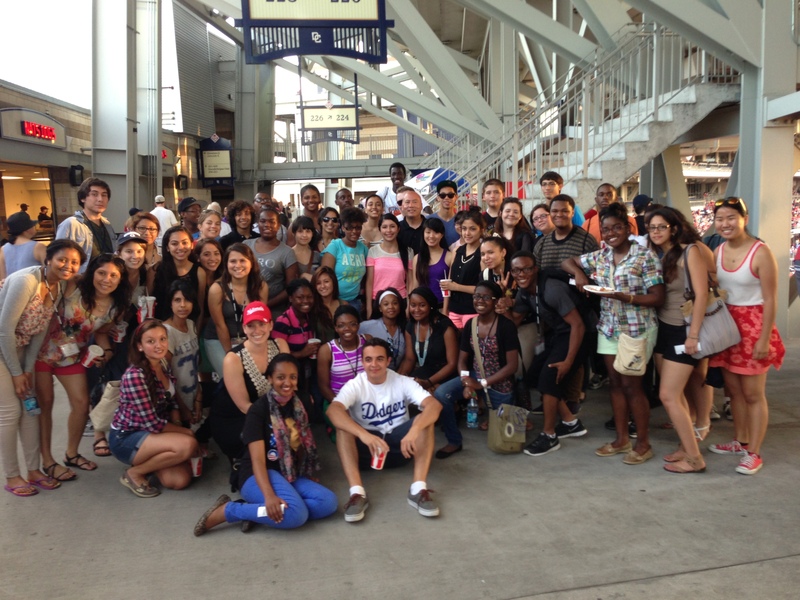 The group was comprised of Cristo Rey – http://www.cristoreynetwork.org – and KIPP – http://www.kipp.org – students. A vast majority of the students are from low-income families, minority students and first ones in their family to attend college. I connected with them during my presentation, which was focused on Mentoring, Networking and Paying It Forward (I told them how my mentor, Ted Leonsis, was mentored by the legendary Father Durkin when he was a student at Georgetown — so in essence these students are the 5th generation of our Pay It Forward program — from Father Durkin to Ted L to me to Gabriel J and then to these HS students who are here at Georgetown for the summer program). I spoke to them on Wednesday afternoon and then I took the entire group to the Nationals game on Friday night. What a group of dynamic, ambitious, smart and wonderful youngsters. I promised a number of the students that I would stay in contact and also try to help them with scholarship funds. Meeting these remarkable youngsters is a true gift. 2. I then met a group of approximately 110 students who were part of the Georgetown Sports Industry Management High School Week. I delivered a 90-minute presentation — focused on Emerging Technology trends, Mentoring, Networking, Philanthropy, Diversity and Globalization. I was blown away by the numerous outstanding questions from these youngsters. And, in just three days, I’ve received over 20 emails from these students — the emails are so well-written. And, most importantly, they seem to “get it” when I stressed the importance of being mentored, mentoring others and giving back. In fact, one remarkable young man told me he donated the money from his bar mitzvah to help rebuild a school in Haiti. He wrote to me that my premise “to do business while giving back” is something we should all learn from. As I told them, I’m simply passing on valuable life lessons from my mentor, Ted Leonsis. Meeting these outstanding young men and women is also a gift. 3. On early Saturday morning, I drove my mentee, Da-Zhi Yu, to College Park for his orientation to the Univ of Maryland’s outstanding AAP program, which is a wonderful 6-week program to prepare first-generation college students for the rigor of college life. I’ve been Da-Zhi and his younger sister for 4+ years. I’ve promised their parents I will do my best to ensure they attend and graduate from college. This includes paying for tuition, books and living expenses (not covered by scholarships and grants). Since I’m single and don’t have children, I may have been robbed of sharing this wonderful experience of bringing a child to college orientation. But, because I’m a mentor / guardian, I am now getting to share this life experience. So, as I’ve noted often, mentoring is indeed a two-way experience – both the mentor and mentee benefit. This day at College Park was indeed a true gift. In summary, I honestly don’t really care about material gifts anymore for birthdays and holidays. At this stage, to me, it’s more about giving back and making a difference. In the past week, I’ve met over 150 high school students — a number of whom I’ll stay in contact with them and hopefully make a positive difference in their lives. These emails they’ve sent me are so powerful and emotional. Each one illustrates clearly to me why it’s so important to offer to mentor, advise and give back. So, I want to thank everyone — from the Cristo Rey students to the KIPP students to the Georgetown undergrads who are serving as mentors to the SIM High School students to Da-Zhi and his fellow AAP students at the Univ of Maryland for giving me the greatest birthday gift of all … the eagerness and determination to learn, grow and to want to make a positive difference. Cheers.